In stock -This product will ship today if ordered within the next 14 hours and 18 minutes. The body uses the minerals Iodine and Selenium to make thyroid hormones, which are essential for heat, energy and metabolism. This formula contains key nutrients to help support the thyroid gland. It containsprovides Iodine and Selenium, plus Tyrosine and ten other vitamins and minerals. Recommended dosage is 2-3 capsules a day. May not be suitable for people with a fish or crustacean allergy. If also taking thyroxine, do not take more than one capsule a day (or more than a total of 30mcg Iodine a day). Not advisable if pregnant or in cases of melanoma, schizophrenia, high blood pressure or if taking MAO inhibitors. Take a look at our Higher Nature Colloidal Silver and Higher Nature Omega 3 Fish Oil to find out more about the benefits Higher Nature products have to offer. Tyrosine, magnesium citrate, capsule: hydroxypropylmethyl cellulose*; natural kelp**, niacin (as nicotinamide), anti-caking agent: magnesium stearate*; ascorbic acid, ferrous gluconate, zinc citrate, l-selenomethionine, manganese citrate, anti-caking agent: silicon dioxide; pyridoxine HCI, copper glutonate, folic acid, cyanocobalamin. ** May contain naturally occurring fish and crustacea. Take 2 - 3 capsules a day, before food, or as a health professional advises. May not be suitable for people with a fish or crustacean allergy. If also taking thyroxine, do not take more then one capsule a day (or more than a total of 30mcg a day). Below are reviews of Thyroid Support Formula - Tyrosine - 60 Vegicaps by bodykind customers. If you have tried this product we'd love to hear what you think so please leave a review. Recommended by my nutritionist since I refused to use the medication from my GP with all its negative side effects. 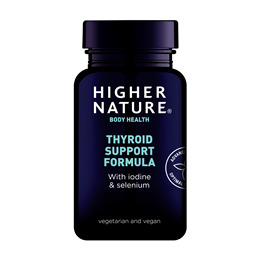 I have been using it for 10 years now and it is excellent and really does support my under active thyroid issue. Excellent product with a useful blend of hard to obtain nutrients. The body uses the minerals Iodine and Selenium to make thyroid hormones, essential for heat, energy and metabolism. 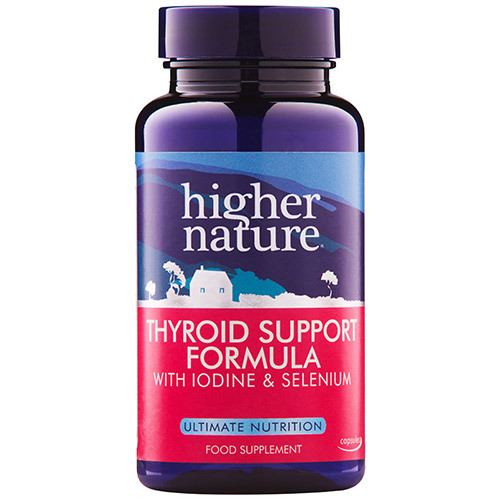 This Thyroid Support Formula provides Iodine and Selenium, plus Tyrosine and 9 other vitamins and minerals.